Many articles have been published that discuss various lateral ankle injuries and specific lateral ankle pathology. The purpose of this article is to explore and present a specific combination of findings that the author’s multiphysician practice has noticed on a frequently recurring basis. A triple injury of ankle synovitis, ankle instability, and peroneal tendon tear are described herein, termed the Lateral Ankle Triad. While it is common to find each of these specific injuries individually, they are often found in combination. Lateral ankle sprains have been shown to be associated with chronic ankle instability. Peroneal tendon tears are often associated with other disorders such as chronic tenosynovitis, severe ankle sprains, ankle fractures, and chronic ankle instability. Following a discussion of the Lateral Ankle Triad injury complex, a retrospective review of 33 peroneal tendon surgeries is presented and discussed. Twenty-one percent of athletic injuries have been said to be inversion ankle injuries. Lateral ankle injuries are very common, with an estimated 27,000 ankle sprains occurring daily in the United States. Of lateral ankle injuries, a torn anterior talofibular ligament is the most frequent pathologic finding.4 The majority of lateral ankle sprains successfully heal without sequelae, despite common undertreatment by the general population and initial treating physicians. Ankle sprains, like broken toes, suffer from a misperception in the general public that there is usually “nothing that can be done for it,” so individuals avoid seeking medical evaluation and treatment following an ankle sprain. This could be one reason why there is such a high rate of recurrence and lingering disability following a “routine” ankle sprain. There is minimal initial immobilization, there is rapid return to weight bearing, and there is infrequent rehabilitation and a loss of proprioception. Although many ankle sprains heal well, approximately 15% to 20% of these patients experience persistent pain or instability. Other sources have related that 40% will continue to report residual disability; this percentage has also been shown to be even much higher. [7,8] One study reported that 73% of ankle sprain patients at a regional primary care facility over a 1-year period had residual symptoms 6 to 18 months following medical evaluation. Another study reported 59% of 380 athletes had residual symptoms and disability that impaired their performance. Many of these patients will not be seen in a foot and ankle physician’s office for evaluation until their injury has failed to heal as expected. The peroneal tendon tear is commonly missed the first time around, as it typically occurs in the presence of an inversion ankle injury. One study reports that only 60% (24 of 40) of peroneal tendon disorders were accurately diagnosed at the first clinical evaluation. These injuries are often carelessly lumped into the diagnosis of “another ankle sprain,” which is usually casually treated with some simple PRICE (protection, rest, ice, compression, elevation) advice from the emergency room or urgent care physician, nurse practitioner, or physican’s assistant. Despite great evidence that shows that early aggressive treatment with compression and icing can greatly reduce recovery time, ankle sprains are commonly undertreated. A study demonstrated that those who use cryotherapy within 36 hours of injury reached full activity in an average of 13.2 days, compared with an average of 30.4 days for those beginning cryotherapy after 36 hours and 33.3 days for those treated with heat. What are the common threads among these patients who deal with prolonged pain, swelling, instability, and dysfunction in the lateral ankle? Many will ultimately be found to have chronic ligamentous tears, some with associated peroneal tendon pathology. This condition can range from simple tenosynovitis, to the more involved and recalcitrant tendinosis, and to an assortment of peroneal tendon tears. Peroneal tendon pathology usually is found in the presence of repetitive and prolonged activity, especially following a period of decreased activity. While it is obvious that all recalcitrant ankle sprains will not neatly fit into the Lateral Ankle Triad, it is a common pattern of injury that can help guide in the selection of appropriate imaging modalities, as well as the surgical approach if and when surgery is indicated. Anatomy relevant to the Lateral Ankle Triad includes the peroneus longus and brevis with its associated tendon sheath, and the lateral collateral ankle ligaments, including the anterior talofibular, calcaneal fibular, and posterior talofibular ligament. The peroneal tendons originate from the peroneal muscle, which are innervated by the superficial peroneal nerve and are housed in lateral leg compartment. The peroneus longus tendon runs posterior to the peroneus brevis tendon in the distal leg and at the level of the ankle. The tendons share a synovial sheath beginning about 4 cm above the distal tip of the fibula. The tendons travel along and through the fibrocartilage-lined retromalleolar groove, on the posterior surface of the distal fibula. The shape of this groove can have a bearing on peroneal tendon dislocation and subluxation. The peroneal tendons are secured within the retromalleolar groove by the superficial peroneal retinaculum. As the peroneal tendons change angle and course around the tip of the lateral malleolus, the common peroneal tendon sheath bifurcates. The peroneus brevis travels a simple and straight path to its insertion at the base of the fifth metatarsal. The peroneus longus has a more complex distal anatomic path: it runs intimate to and just beneath the peroneal tubercle on the lateral wall of the calcaneus on its way to the cuboid notch or groove, where it angles medially to its insertion at the plantar first metatarsal base and medial cuneiform. The os peroneum is a common finding at the lateral cuboid, and is sometimes implicated in the development of a symptomatic peroneus longus tendon. The peroneus brevis everts and abducts the foot, and plantarflexes the ankle. The peroneus longus also everts the foot, and has a secondary plantarflexion effect on the ankle. It plantarflexes the first ray and stabilizes the medial column during the stance phase of gait. The peroneal tendons are dynamic stabilizers of the lateral ankle ligaments. The mechanism of acute injury to the peroneal tendons is plantarflexion and inversion of the ankle, with the foot in a weight-bearing position. This stance places the peroneal tendons in a taut position, exposing them to injury. Patients who develop the Lateral Ankle Triad will usually present with a history of ankle sprain, complaints of pain, persistent swelling, and a sense of instability in the ankle. 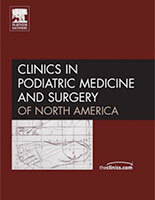 Clinical findings include localized edema, which tends to center at the anterolateral ankle joint and the sinus tarsi area, overlying the anterior talofibular ligament. A path of longitudinal edema along the course of the peroneal tendons is a sure sign that the injury is more complex than a typical ankle sprain, and indicates some level of peroneal tendon pathology. Intrasheath edema and tenosynovitis, which often accom- panies peroneal tendon tears, will cause this pattern of longitudinal edema. Palpation tenderness is almost always present directly over the injured ligament(s) and tendon tear. Slow and methodical anterior ankle joint line palpation, combined with minor joint motion and manipulation, can help assess the presence of anterior joint capsule pathology. Palpation of the anterolateral joint with simultaneous inversion stress can help identify the presence of fibrous bands and adhesions, which commonly accompany chronic ankle sprains. Careful evaluation of the ankle joint itself will help direct the possible selection of an arthroscopy in addition to the tendon and ligament repair. Ankle joint stress maneuvers should be performed in the workup and evaluation of the Lateral Ankle Triad. Inversion stress testing with the ankle joint in a dorsiflexed and plantarflexed position can help evaluate the integrity of the anterior talofibular and calcaneal fibular ligaments. Laxity is usually found in ankle inversion stress, which will also commonly elicit pain. Anterior drawer stress testing evaluates the strength of the anterior talofibular ligament. In the presence of a tear or attenuation of this ligament, increased anterior migration of the ankle joint is felt, and pain is often accompanied with the stress range of motion. Isolated muscle stress testing of the peroneals is performed bilaterally, with care to note weakness or pain elicited. In the presence of split, longitudinal tears of the pero- neal tendons, weakness is not commonly found unless the tear is chronic. Complete ruptures will obviously result in loss of strength in the peroneal tendon complex, but complete tears are much less common than the typical longitudinal pattern. Routine, 3-view radiographs of the ankle should be obtained in the thorough evaluation of suspected Lateral Ankle Triad. Even though the suspicion is for soft tissue pathology, the ankle joint is examined for symmetry, spacing, and alignment; radiographs can help rule out avulsion fractures of the distal fibula, osteochondral lesions, exostosis, arthritis and periarticular changes, joint diastasis, angular deformity, bone cysts, lateral process talar fractures, avulsion injury at peroneal retinaculum, and os trigonum pathology. In the presence of distal peroneal tendon symptoms, dorsoplantar and lateral oblique radiographs of the foot should also be obtained to rule out avulsion injury at the fifth metatarsal base or the presence/absence of an os peroneum. Stress radiography is also recommended, and includes anterior drawer stress and inversion/talar tilt images; these are compared with the asymptomatic contralateral side. Chronic ankle instability is sometimes bilateral, however, though symptoms may be more prominent unilaterally. Diagnostic ultrasonography has been shown to be an effective imaging modality in the evaluation of the lateral ankle. It can be used to image the lateral collateral ankle ligaments, and has a high specificity and sensitivity in finding peroneal tendon tears. There are some practical advantages to the use of ultrasonography; it can offer immediate diagnosis and avoid delays in treatment, it is less expensive than magnetic resonance imaging (MRI), it avoids exposure to radiation, and it can be used dynamically. However, ultrasonography does require significant skill by the physician or technician in performing and interpreting the scan to diagnose with confidence. MRI of the ankle is indicated and recommended in the presence of patients with persistent lateral ankle pain and swelling who have not responded to typical conservative treatment. In addition to ruling out osteochondral lesions, MRI is sensitive and specific in the evaluation of the lateral collateral ankle ligaments and the peroneal tendons. It is less reliable in detecting ankle joint synovitis, fibrous bands, and small loose bodies. MRI also does not always offer good visualization of the cuboid tunnel where pathology is likely to exist in distal peroneal tendinitis. The triple injury of ankle synovitis, ankle instability, and peroneal tendon tears will usually have some common predisposing factors. In most cases, there is a history of lateral ankle sprain, and often there are recurrent sprains. The mechanism of injury that causes peroneal tendon tears has been described as plantarflexion with inversion. In the absence of an acute tear, chronic tendon tears can result from repetitive activities in the presence of chronic ankle instability. With this underlying laxity, there is additional excursion available in the ankle joint with normal day-to-day motion, but especially in the presence of strenuous activities and repetitive exercise. Over time, this leads to the development of ankle joint synovitis, and sometimes to the formation of anterolateral joint fibrous bands that are frequently discovered arthroscopically. Other predisposing and/or contributing factors in the development of the Lateral Ankle Triad include a low-lying peroneal muscle belly, presence of a peroneus quartus muscle, pes cavus foot type, peroneal tendon dislocation or subluxation, abnormal shape and depth of the retrofibular groove, hypertrophic peroneal tubercle, equinus, repetitive activities such as running and dancing, and a sudden onset of aggressive exercise following a period of inactivity. is plantarflexed and inverted. Patients with significant equinus deformity will function in a constant plantarflexed position of the ankle. Similar to cavus foot type, which places the foot and ankle in an inverted position, equinus can have a strong contributing effect on potential compromise and stress to the lateral ankle by keeping the ankle in a less stable, plantarflexed attitude. The effect of equinus on chronic ankle instability should be examined further, as successful treatment of the lateral ankle requires comprehensive management of the contributing factors. A beautiful peroneal tendon repair in an uncorrected cavovarus foot may be considered unacceptable, just as a simple posterior tibial tendon repair in the presence of a collapsing flatfoot deformity is considered not strong enough to hold up over time. The Lateral Ankle Triad should be considered in all cases of chronic lateral ankle insta- bility, and care should be taken to evaluate all 3 components: integrity of the lateral collateral ligaments, possible presence of intra-articular synovitis, and the level of injury to the peroneal tendons. Acute ankle sprain with peroneal tendon tear that requires surgical repair would have less indication to consider ankle arthroscopy, but strong consideration should be given in cases of chronic ankle instability and chronic peroneal tendon pathology. MRI will often reveal the presence of a chronically torn anterior talofibular ligament, with pathology in the calcaneal fibular ligament sometimes found as well. Posterior talofibular ligament tears are found less frequently. In an article that analyzed 639 ankle injuries, of 547 patients with ankle sprains that did not cause a fracture, the ante- rior talofibular ligament was injured 83% of the time (453 of 547). The calcaneal fibular ligament was injured at a rate of 67% (366 of 547), and the posterior talofibular liga- ment at 34% (187 of 547). Injuries to the ankle joint capsule in this study occurred in 180 cases and to the peroneal tendons in 83 cases. A study from Germany discussed surgical findings with anterior ankle partial synovectomy. Of the 35 patients studied, 8 were noted to have hyperlaxity of the ankle joint. One study reported that in the presence of chronic ankle instability, peroneus brevis tendon tears were observed in 25% of the cases, with 77% of patients having tenosynovitis. The peroneus brevis tears far more frequently than the peroneus longus. In a retrospective review of peroneal tendon injuries, Dombek and colleagues related that 88% of peroneal tendon tears occurred to the brevis tendon, and only 13% to the peroneus longus. In terms of surgical correction of the Lateral Ankle Triad, the approach can be somewhat routine and reproducible. Ankle arthroscopy is performed with a standard 2-portal approach to the anterior ankle. In the absence of talar dome lesions, the procedure can typically be performed without a joint distractor. The joint is inspected in a step-wise approach and synovitis and fibrous bands are debrided appropriately. A longitudinal curvilinear incision is made just posterior to the distal fibula and curved distally along the course of the peroneal tendons. The incision is centered over the peroneal tendon pathology, extending more proximally or distally based on MRI documentation of the location of the tendon tear. Meticulous soft tissue dissection is of ultimate importance in the lateral ankle, as sural neuritis is a far too common postoperative complication following lateral ankle and foot surgery. Laxity in the peroneal retinaculum can be observed and later tightened and repaired as necessary. The peroneal tendon sheath is exposed and examined. Straw-colored tenosynovitis fluid is often drained on first opening the sheath, a representation of the inflammatory process within the sheath. It is recommended to put the ankle through range of motion and stress testing while visualizing and palpating the peroneal tendon sheath to evaluate for subluxing or dislocating tendons. The peroneal tendon sheath is incised longitudinally above and below the tendon tear to allow for adequate debridement and repair. Achieving adequate exposure is important as attempting repair while tunneling under the proximal or distal extent of the incision can increase the risk of inadvertent sural nerve laceration or entrapment with suture material. There are commonly accepted principles in the surgical approach to peroneal tendon tears. If less than 50% of the tendon is torn, primary repair, debridement, and tubularization is indicated. For extensive tearing that involves more than 50% of the tendon, tendon grafting or side-to-side anastomosis/tenodesis to the adjacent peroneal tendon is indicated. [19,20] In cases of tendinosis, debridement can be performed, with a consideration for Topaz radiofrequency coblation or platelet-rich plasma. (which can show avulsion-type ligament tears) or intraoperative findings. Patients are typically casted for 3 to 4 weeks following surgery for the Lateral Ankle Triad. There has been a recent push to shorten the period of immobilization and to encourage early range of motion, and to initiate physical therapy at 2 to 3 weeks postoperatively. A retrospective review of peroneal tendon surgery performed by surgeons at the University Foot & Ankle Institute in Southern California was completed for a span of 16 months, extending from September 2008 to December 2009. All peroneal tendon surgeries performed during this time frame were included, with a total of 33 patients and their surgical procedures reviewed. All 33 patients had an MRI performed preoperatively, with 91% showing evidence of peroneal tendinitis, tendinosis, or a peroneal tendon tear. Three cases with peroneal tendon tears observed surgically did not show a tear on the preoperative MRI. Intraoperative findings often show more significant pathology than the MRI. The average patient age was 45 years, with a range of 14 to 65 years. There were 15 males and 18 females. The average duration of symptoms before surgery was 3.6 years, though 39% (13 of 33) had symptoms for 6 months or less. The review showed and confirmed that peroneal tendon tears predominantly affect the peroneus brevis tendon. The case review showed that 12% had combined peroneus brevis and longus tendon tears (4 of 33). Eighty-two percent of the cases had an isolated peroneus brevis tear (27 of 33), and solitary peroneus longus tears occurred in only 6% of the study (2 of 33). Including the dual tears found, 94% of cases had a peroneus brevis tendon tear (31 of 33), while 18% had involvement of the peroneus longus tendon (6 of 33). The same 33 cases were reviewed in regard of the lateral ankle ligaments. Seventy-three percent of these patients (24 of 33) with a peroneal tendon tear had associated attenuation, chronic thickening, or tears of lateral ankle ligaments, which were surgically repaired concurrently. Fifty-five percent of the cases included in the review (18 of 33) also underwent an ankle arthroscopy as a combined procedure. Each of the cases that included surgical arthroscopy included anterior ankle synovectomy (18 of 18); none of the cases had a pristine anterior ankle joint, and each of them underwent debridement of the synovitis. Of the 18 arthroscopy procedures reviewed, 33% (6 of 18) had fibrous bands present, which were debrided arthroscopically. Fibrous bands are not typically appreciated on MRI, are usually found at the anterolateral joint gutter, and can cause lateral ankle pain, limitations in joint motion, and an uncomfortable catching sensation of the ankle joint. Especially in athletes, fibrous bands can be a subtle contribution to persistent ankle pain. Eleven percent of the cases who underwent arthroscopy also noted the presence of loose bodies, which were surgically debrided and excised. As with fibrous bands, MRI does not always pick up the presence of small anterior ankle joint loose bodies. In cases of lateral ankle pain with an MRI that confirms a peroneal tendon tear or tendinosis with associated ligamentous pathology, the author would assert that strong consideration should be made to include an ankle arthroscopy. It is not always indicated, however. An acute injury, with a fresh peroneal tendon tear, with no anterior or anterolateral joint symptoms would not warrant the inclusion of an ankle arthroscopy. In the analysis, of the 18 cases that included an arthroscopy, the average duration of symptoms before surgical intervention was 5.6 years. The average duration before surgery for all the cases reviewed was 3.6 years. This result shows a trend to consider ankle arthroscopy as an adjunctive procedure to the tendon and ligament repair in the more chronic cases, as these are more likely to have caused damage to the ankle joint itself. The Lateral Ankle Triad is a combination of ankle joint synovitis, chronic lateral ankle instability, with a peroneal tendon tear. A follow-up article is already in progress, which will include a 10-year retrospective analysis of the Lateral Ankle Triad procedures performed within the author’s multiphysician practice. This analysis will solidify trends and will help direct further treatment, as well as the formation of protocols and clinical and surgical recommendations. The main recommendations to be considered are: obtain MRI in the thorough evaluation of peroneal tendon pathology; assess the lateral collateral ankle ligaments for instability even in the presence of no MRI documentation of ligament tears; consider arthroscopy as an adjunctive procedure to address more subtle changes such as joint synovitis and fibrous bands. The Lateral Ankle Triad should help clinicians consider this possible combination of injury, which with a careful workup can help uncover more subtle changes that can occur in the presence of chronic ankle instability and peroneal tendon tears. 1. Hubbard TJ, Kaminski TW, Vander Griend RA, et al. Quantitative assessment of mechanical laxity in the functionally unstable ankle. Med Sci Sports Exerc 2004;36(5):760–6. 2. Clarke HD, Kitaoka HB, Ehman RL. Peroneal tendon injuries. Foot Ankle Int 1998; 19:280–8. 3. Kannus P. Treatment for acute tears of the lateral ligaments of the ankle. J Bone Joint Surg Am 1991;73A:305–12. 4. Mizel MS, Hecht PJ, Marymont JV, et al. Evaluation and treatment of chronic ankle pain. J Bone Joint Surg Am 2004;86:628–32. 5. Bynum JA, Crates JM, Aziz-Jacobo J, et al. Modified Brostrom technique using knotless suture anchors. Tech Foot Ankle 2010;9:29–31. 6. Safran M, Benedetti R, Bartolozzi A, et al. Lateral ankle sprains: a comprehensive review. Part 1: etiology, pathoanatomy, histopathogenesis, and diagnosis. Med Sci Sports Exerc 1999;31:S429–37. 7. Braun BL. Effects of ankle sprain in a general clinic population 6 to 18 months after medical evaluation. Arch Fam Med 1999;8:143–8. 8. Yeung MS, Chan KM, So CH, et al. An epidemiologic survey on ankle sprain. Br J Sports Med 1994;28:112–6. 9. Dombek MF, Lamm BM, Saltrick K, et al. Peroneal tendon tears: a retrospective review. J Foot Ankle Surg 2003;42:250–8. 10. Hocutt JE, Jaffee R, Rylander R, et al. Cryotherapy in ankle sprains. Am J Sports Med 1982;10:316–9. 11. Molloy R, Tisdel C. Failed treatment of peroneal tendon injuries. Foot Ankle Clin 2003;8:115–29, ix. 12. Heckman DS, Reddy S, Pedowitz D, et al. Operative treatment for peroneal tendon disorders. J Bone Joint Surg Am 2008;90:404–18. 13. Grant T, Kelikian A, Jereb S, et al. Ultrasound diagnosis of peroneal tendon tears: a surgical correlation. J Bone Joint Surg Am 2005;87:1788–94. 14. Ritter C. Acute peroneal tendon tears. Tech Foot Ankle Surg 2009;8:106–11. 15. Speer KS, Bassett F. Longitudinal rupture of the peroneal tendons. Am J Sports Med 1993;21:354–7. 16. Fallat L, Grimm DJ, Saracco JA. Sprained ankle syndrome: Prevalence and analysis of 639 acute injuries. J Foot Ankle Surg 1998;37:280–5. 18. DiGiovanni BF, Fraga CJ, Cohen BE, et al. Associated injuries found in chroniclateral ankle instability. Foot Ankle Int 2000;21:809–15. 19. Krause JO, Brodsky JW. Peroneus brevis tendon tears: pathophysiology, surgical reconstruction, and clinical results. Foot Ankle Int 1998;19:271–9. 20. Redfern D, Myerson M. The management of concomitant tears of the peroneus longus and brevis tendons. Foot Ankle Int 2004;25:695–707. 21. Brostrom L. Sprained ankles: VI. Surgical treatment of “chronic” ligament ruptures. Acta Chir Scand 1966;132:551–65.